In collaboration with our partners and our own wood workshop, we can make beautiful wooden packaging for your products. Souvenirs wine or jam as a gift or for sale look so much nicer in a proper packaging. If necessary, we can burn a simple logo on a box or we can even do more complicated pictures while using laser. An interesting gift idea is a wooden base with laser carving for different forged items. 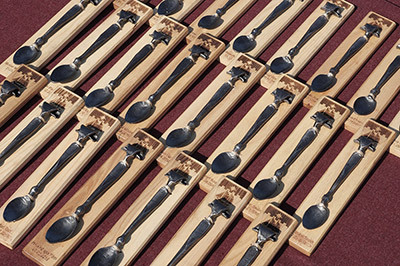 For example, we have been producing “children’s first weaning spoons” for children born in Estonia’s municipalities. Handcrafted spoon is attached to the wooden base with engraving of kid’s name and other symbols – for example the coat of arms of the municipality or whatever one has in mind.